Hi all - Joan and I are currently in the works prepping the second chapter, working on character design, storyline plotting, and general fine-tuning of things around here. With all that underway, we'll be utilizing this week and the next two to make sure that we're not just rushing into the chapter and then needing to delay later on. So we're going to post some other material in this interlude period while you're waiting. Thanks for understanding. 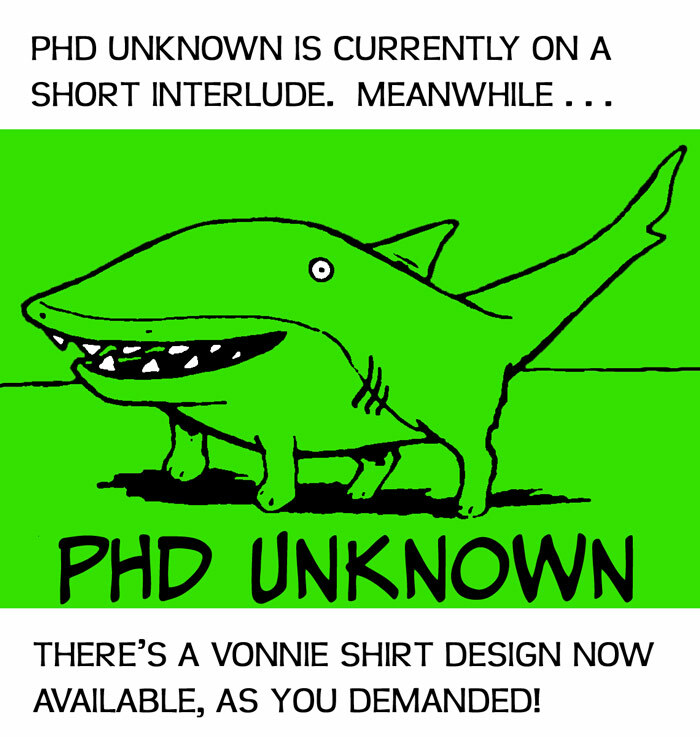 First and foremost, we've got a PhD Unknown shirt that you can wear with pride, showcasing a grinning Vonnie - it's available with Vonnie in either black or white, and you can put it on whatever shirt color you like. We'll be adding more designs and images in due time. Secondly, I'll be at Emerald City Comic Con at the end of March, March 28-30, where I'll have mostly Surviving the World things to showcase, but also a PhD Unknown thing or two. Either way, feel free to stop by the Topatoco table and say hi, and maybe I'll do my best Vonnie impression for you.